Every NUMBALUM who marches in the Friday parade, Saturday pregame, or Saturday halftime—or who stands in the stands at the game and plays—must be registered for NUMBALUMS Homecoming. The deadline is October 3 (with late registrations accepted until October 10 for a $20 late fee). Click here for more information and a registration link. NUMBALUMS who march pregame or halftime, or who simply play in the stands, get into the game for free. This is because they shed blood, sweat, and more sweat for the Band as a NUMB member, and we like to remind them how TOTALLY FUN it is to do a chair step with each year that passes. But while they're off marching, you'll need a game ticket. The NUMBALUMS have arranged for discount tickets in a Booster Block for friends and family. You'll have plenty of people around to commiserate with about being married to/related to/friends with a NUMBALUM. We're sure there are stories. For more information on purchasing a ticket in the NUMBALUMS Booster Block, click here [PDF]. Step 3: Prepare your Homecoming survival kit. For the Friday parade, you'll want to bring a camera—because it's so cute when those alums march down Sheridan Avenue in something that vaguely looks like a parade formation. If your camera has a video function, be sure to activate it in time to catch a full refrain of "Go U," and catch the crowd reaction—they adore the NUMBALUMS and look forward to their stoic fun-loving parade presence every year! 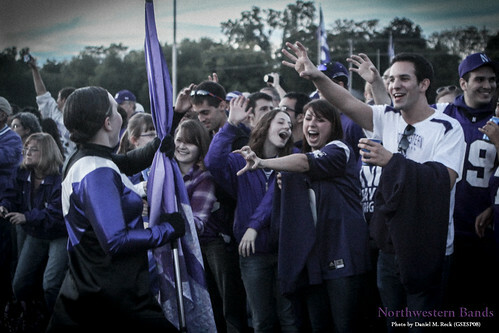 After the parade, you'll be going to the Pep Rally on Deering Meadow, then the NUMBALUMS bar night at Prairie Moon. Remember, alternate each refreshing beverage with a refreshing water, and you'll be right as purple rain the next day. But just in case, maybe bring some Tylenol. On Saturday, you'll be attending a behind-the-scenes tour of the "NUMB Uniform Through the Years" exhibit at Deering Library, so grab a notepad and pen. The stories will be pouring out of archivists and NUMBALUMS alike as the group wanders through the physical remnants of NUMB's history. You'll also want to jot down the archivist's email address so that when you get home, you can scan and send him all your loved one's photo albums from their time in NUMB! After that, your plans may vary; perhaps you'll attend a reunion party or grab lunch with friends. Your beloved NUMBALUM will need to report to registration at Ryan Field by 2 p.m., but that will give you plenty of time to mosey over to the NUMBALUMS tailgate in the West Lot at 2:30 p.m. The NUMBALUMS will provide basic grilled goods and sides, but all attendees are encouraged to bring food and/or beverages to share! As the tailgate gets going, you might get challenged to a variety of parking lot games. You'll need to be at the top of your game—and the football game hasn't even started yet—so grab some caffeine. Those NUMBALUMS are just so full of energy! Before you know it, it'll be time for Wildcat Alley! Head in to watch your beloved NUMBALUM fast-enter in place and listen in awe as they play with NUMB after seemingly not touching their instrument since graduation. Did they really just learn those tunes today? You are so proud. Take more pictures. And just like that, it's time to head into the stadium! Grab your pre-purchased game ticket (see Step 1) to watch NUMBALUMS pregame (more pictures! ), followed by NUMB's pregame, and then kickoff! This is your chance to sample the fine fare of Ryan Field, from Wildcat hot dogs to strangely delicious fake cheese nachos, so bring some cash. At halftime, the NUMBALUMS will join NUMB on the field for a stationary halftime show. Be sure to stand up during the performance, and cheer wildly for the amazing alumni who take to the field to show us they've still got it! After the game, head back out to the West Lot for a short postgame to celebrate the 'Cats performance. If there's anything left over from the pre-game tailgate, we'll consume it now. Head back to your home/hotel for a good night's sleep. Your NUMBALUM will want to be up on Sunday morning to attend the NUMBALUMS Annual Meeting at 10:30 a.m. at the NAA Alumni Building. You'll probably skip this one, so grab a book and head to one of Evanston's delightful cafés for a coffee and a croissant. Your NUMBALUM will be done in time to join you for lunch, say final goodbyes to far-flung NUMBALUMS friends who returned for the weekend, and head home, satisfied after one heck of a Homecoming. You now know a little more about what it means to have P&G (Pride & Guts)! Thanks for attending Homecoming and for supporting your beloved NUMBALUM! Still not sure what to bring? More questions? Contact us!